A 120-foot-tall schooner ran aground and got stuck in shallow waters near the Statue of Liberty on Saturday afternoon, officials said. 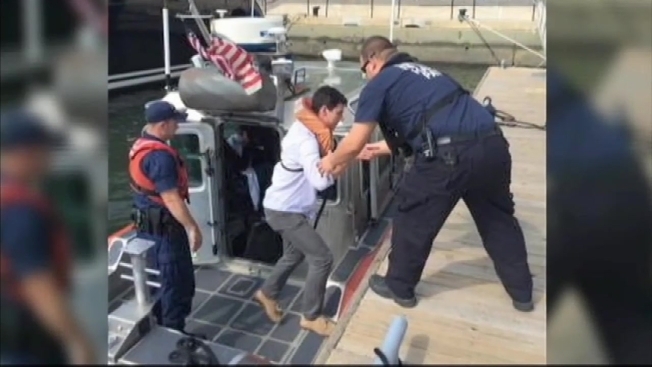 No injuries were reported and the 121 tourists on board were ferried in small boats to a lower Manhattan marina. The Clipper City, a 158-foot-long steel-hulled boat that has six sails, two topsails and two steel masts, "hit something soft, like mud or a shoal" and ran aground off Liberty Island just after 1 p.m., said Thomas Berton, owner of Manhattan by Sail, which operates the tall tourist ship. The ship was anchored in the harbor near the Statue of Liberty and was to be brought back to port by a tugboat after high tide, Berton said. He said the vessel was not damaged. The Clipper City didn't take on any water and there were no reports of pollution, said U.S. Coast Guard Petty Officer Frank Iannazzo-Simmons. The passengers were brought to the North Cove Marina via nine small rescue boats from the Coast Guard, fire and police departments. The original Clipper City was built in 1854 and was designed to carry lumber, according to Manhattan by Sail's website. The ship, which has decommissioned in 1890 but underwent multiple restorations since then, has been making daily trips from the South Street Seaport since then, the website said.